These Tamales huastecos are made all over the Huasteca Region of México. The Huasteca region is located in the Northeastern part of México, it includes part of the states of Hidalgo, San Luis Potosí, Veracruz, Tamaulipas and some part of Queretaro where there are a few places where the Huastec and Náhuatl languages are still spoken. This is a unique recipe, just how it is made in the country farms (without the electric mixer). The addition of onion and garlic is optional but I like to add them to my tamales. 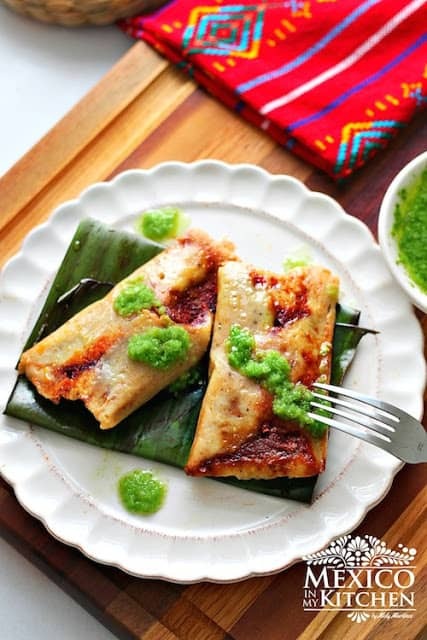 These tamales are a must on the Day of the Dead festivities in México.This recipe of tamales varies slightly where some cooks add tomato and sesame seeds to the sauce. And even though it has the seeds of the peppers in the sauce it is not spicy. The Tamales wrapped in banana leaves are common in the tropical coastal areas of México. Place the peppers into a bowl with 2 cups of warm water to soak for 30 minutes or until soft. In the same skillet, you roasted the peppers, lightly roast the peppers seeds and the black peppers corns, allowing them cool before mixing with the peppers. Do the same with the sesame seeds if using. Drain the peppers, reserving soaking water, and place them in a blender puree with garlic, onion, black pepper and seeds. Add 1/2 cup of the soaking water. Use a good blender to have better results. The end result should be a fine thick sauce. Dissolve the 1/3 cup of masa with some water and add to the “Chilpan” sauce and stir. Add salt and taste. Add this mixture to the meat and let marinate while you prepare the corn dough. This sauce can be made in advance. I did it the day before. Beat lard and salt with an electric mixer or by hand until light and creamy. Add the Corn dough and broth little by little keep beating until dough is well mixed, smooth and homogenous. The dough will be light enough when a small amount floats when dropped in a glass of water. Just take care that it is well integrated and smooth. After removing the banana leaves from their plastic package cut the rough hard part of the edge using your kitchen scissors. Cut the banana leaves into rectangles of about 9 inches wide. Place them one with one over the stove top flame in a steady and fast movement, they will change to a glossy color and become pliable. Rinse with warm water and dry well with a kitchen towel. Place 1/4 of the batter into each leaf and spread it with wet fingers or with the back of a spoon top with one or two pieces of meat with the sauce. Fold one side of the leaf toward the center; and then the other side overlapping, then fold the ends to the point where the dough begins on each side. Line the steamer with banana leaves scraps if you have leftovers. Arrange in a steamer that has been previously filled with 2 inches of water. Cover with more banana leaves and a kitchen towel and pot lid. You can also use a piece of aluminum foil or plastic to cover the tamales. Cook for 2 hours after the water starts boiling. Use the old trick of dropping a coin into the bottom of the steamer when adding the water to the pot. The coin will start rattling after the water has evaporated. If this happens then add more water carefully removing the lid facing your face to avoid a steam burn.To check if the tamales are cooked. Remove one from the pot and if the leave peels off easily, they are done. If not put back on the stove for 15 more minutes. This recipe of tamales varies slightly where some cooks add tomato and sesame seeds to the sauce. And even though it has the seeds of the peppers in the sauce it is not spicy. The Tamales wrapped in banana leaves are common in the tropical coastal areas of México. 4 packages of banana leaves you can find them in the frozen foods section. Lightly toast the Guajillo, Ancho and Morita Peppers in a skillet. Gently press the peppers with a spatula, as soon as pepper’s skin start forming some blisters remove from the skillet, do not let them burn. If using the Morita peppers, they will give the tamales a rich smoky flavor. In the same skillet you roasted the peppers, lightly roast the peppers seeds and the black peppers corns, allowing them cool before mixing with the peppers. Do the same with the sesame seeds if using. Dissolve the 1/3 cup of masa with some water and add to the “Chilpan” sauce and stir. Add salt and taste. Add this mixture to the meat and let marinated while you prepare the corn dough. This sauce can be made in advance. I did it the day before. After removing the banana leaves from their plastic package cut the rough hard part of the edge using your kitchen scissors (This is the leaf’s center vein). Place 1/4 of the batter into each leaf and spread it with wet fingers or with the back of a spoon (Have a bowl with water at hand for this purpose) top with one or two pieces of meat with the sauce. Fold one side of the leaf toward the center; and then the other side overlapping, then fold the ends to the point where the dough begins into each side. Cook for 2 hours (check notes above) after the water start boiling. Use the old trick of dropping a coin into the bottom of the steamer when adding the water to the pot. The coin will start rattling after the water has evaporated. If this happens then add more water carefully removing the lid facing against your face to avoid a steam burn. To check if the tamales are cooked. Remove one from the pot and if the leave peels off easily, they are done. If not put back into the stove for 15 more minutes. • From 2 pounds of prepared masa (corn dough) you will make between 25 to 30 tamales. • The filling could be uncooked pork or chicken. The chicken is cut into pieces. If using already cooked meat, the cut the steaming time to 1 hour and 5 to 10 minutes. The Tamales huastecos from the Huasteca Region of Veracruz and Tamaulipas are made with the Chilpan sauce prepared with a variety of 7 peppers: Ancho, Pasilla, Cascabel, Morita, Piquin, Mulato, and Guajillo. The sauce is thickened with the addition of a small amount of the corn dough which gives its characteristic flavor to these tamales. Others fillings use uncooked chicken, pumpkin, shrimp, dry meat and the ones called “cuiches” made out without filling and using just fresh corn. These tamales huastecos can be frozen for months and when you want to reheat them, steam them again or just defrost them and warm them in a griddle-comal. I’m really happy to close the month with a blogger that some of you might already know, my dear friend Nora from her blog ”Gusta Usted”. 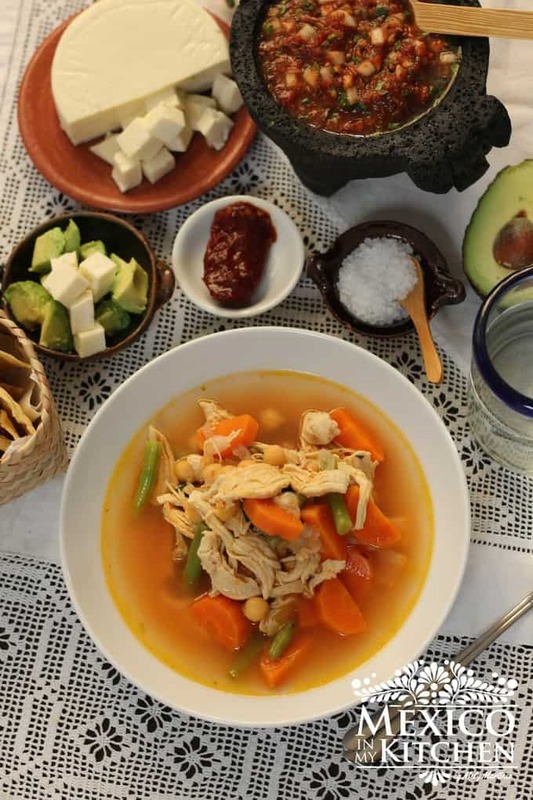 I am sure that many of you Mexicans like me have found yourselves missing your mother’s soup, rice, or stew, and in turn discovered her blog via the internet. After cooking one of her recipes, you must have said: “It tastes just like back home!”. And yes! She’s the real deal, the classic Mexican Home Cook, and today she is bringing us the recipe that takes me back home too. These are made just like my mom and grandmother used to make them. If you’re really into Mexican food, visit her blog and use Google Translator, it will be well worth doing it. This has been a fun month for me, I really enjoyed having some of my fellow blogger friends visit and invite you into their kitchens to share their talents. This is part of our Heritage, who we are, and what we are proud of. I hope you have enjoyed it as well! Assumption wrong and not. The leaves have a very distinct flavor. I love them more than corn husks. It is such a different flavor to the tamales. I also use it in wrapping meats to cook in the oven or steam. Great for wrapping fish. Nora's recipes are the best! She is a great cook, isn't she? And always shares something amazing in her blog. These tamales look so good, I can't wait to try them! 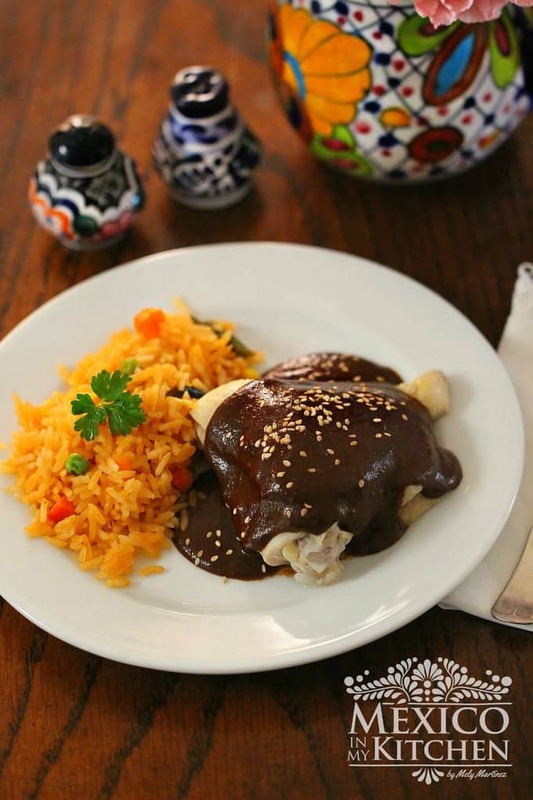 Mely, thanks for making this Hispanic Heritage Month so special and for showcasing all the wonderful Mexican bloggers and their food here in your space. Let's not forget that you, yourself, are one of those great representatives of Mexico's vast heritage. Thank you again and take care. The steaming make the banana leaves to release an aroma and taste that form a perfect marriage with the corn dough-masa. and also to make corn tortillas like they do in the south of Mexico. Yum, Yum! tamales, comeinza la temporada de que estan por todos lados, yo no se prepararlos y las veces que lo hemos intentado no quedan. Siempre los compramos, recientemente encontramos una nueva vendedora asi que nos surtimos con ella cada viernes. Ojala y pronto encuentre alguien que prepare este tipo de tamales que tambien me gustan mucho. Gracias por compartir la receta. You are very kind, like they say here: Likewise! I want to see some of those salsas in your book. Hey! Yolanda, They are usually sold at the Asian Markets, they come in a flat plastic bag. They are sold frozen, so look in the frozen section. For people that lives close to an Hispanic Market the can even find them fresh around the month of December. But if you can make them with corn husks too. A wonderful guest post and amazing recipe! That speciality looks so scrumptious. A parte týu los hiciste Mely 😀 verdad? wow!! este mes me has dejado con la boca abierta cada vez que publicas!! amiga eres dedicadísima a todo lo que haces!! Ahora , como dice Prieta , queremos recetas tuyas !! This is a great tutorial and your Abobo looks so delicious. This is a great recipe. Thank you so much for sharing with Full Plate Thursday and have a great week end! Muchas gracias Mely! Te quedó excelente! Nunca eh probado tamales Huastecos, pero tengo un amiga Salvadorena que su MaMa hace los tamales en hojas de banana y se me hicieron bien ricos. SI Pily, son los Tamales tipicos de mi tierra y con frecuencia loa hago en casa. Los Tamales en hoja de platano son muy ricos Dora, que bueno que tuviste la oportunidad de probar los del Salvador. Gracias a ti Nora, por compartir tu receta. La segui al pie de la letra y quedaron perfectos ! Tamales are a very good Mexican food. I have my own source of Mexican food in Scottsdale from Blue Adobe Grille. Ayy Mely como siempre antojando! Estos tamales son deliciosos, ya sea de pollo, puerco o verduras, de mole e infinita variedad que los ofrecen en Tampico, Veracruz y gracias a Dios ya los venden en Monterrey. Thank you for your recipe. For the Chilpan, do you use dried or fresh peppers? We use dried peppers for the salsa and the chilpan. Happy cooking! Can I use traditional Chinese bamboo streamer to make this kind of tamales? I have seen many variations in making them and i don't know which is the best choice to steamer this kinds of tamales. However, thank you for your recipe. I think you can use a Chinese bamboo steamer to make this tamales.